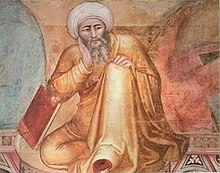 Abū 'l-Walīd Muḥammad ibn Aḥmad ibn Rushd (أبو الوليد محمد بن احمد بن رشد), mair weel-kent juist as Ibn Rushd (ابن رشد), an in European leeteratur as Averroes (1126 – 10 December 1198), wis an Andalusian Muslim polymath; a maister o Islamic philosophy, Islamic theology, Maliki law an jurisprudence, logic, psychology, politics, Arabic muisic theory, an the sciences o medicine, astronomy, geography, mathematics, pheesics an celestial mechanics. He wis born in Córdoba, Al Andalus, modren-day Spain, an dee'd in Marrakesh, modren-day Morocco. His schuil o philosophy is kent as Averroism. He haes been describit bi some as the foondin faither o secular thocht in Wastren Europe an "ane o the spiritual faithers o Europe," awtho ither scholars oppose sic claims. Wikimedia Commons haes media relatit tae Averroes.